The verbal altercation between the ex-Lakers teammates began when Howard grabbed a rebound and Bryant got in his face, trying to contest an outlet pass. Howard threw elbows to clear space, and one appeared to connect with Bryant's chin. 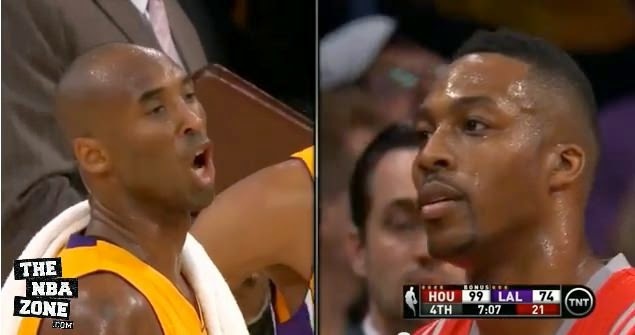 Kobe And Dwight Howard Talk Trash, Get Double Technicals [VIDEO] by The NBA Zone. "He elbowed me in the face, and I'm gonna let him know, I don't like that," Bryant said after the game. "It's that simple." After a review, Bryant was assessed a personal foul and Howard a flagrant foul 1, and each player was tagged with a technical foul. "It's fantastic," Bryant said. "That's the game. That's all part of the game. Elbows are a part of the game. Trash-talking is part of the game. I don't know where the NBA became so sensitive. It's all part of it." Bryant repeatedly called Howard "soft." Howard refused to go into specifics when asked about the incident by reporters. "What do y'all want me to say, because I'm not [going] to give y'all nothing," Howard said. "It's stupid. We won the game. It's over with. I mean, there's no need to go into it. We won the game. It's about basketball. I mean it's over with. It's nothing. I'm not even focused on it." "You can't help but like him," Bryant said, smiling. "He's a teddy bear. You can't help but like him. I really meant that. He's a really nice kid. But you know, when you're competing, you have a goal in mind. I know one way to get there. There's certain times when we didn't see eye to eye, but that wasn't one of those situations."